In the Slovak as well as in neighboring countries, must in transit motorways and certain roads with cars to 3.5 tons a valid evignette. Label must also be vehicles with at least three wheels, four-wheelers and motorcycles without a side-car windshield. In the event that the vehicle category M1, N1, N1G, M1G or trailer equipped with a category O1 and O2, you need to purchase additional highway trailer label intended for trailers. Signs are available in three different lengths of validity, 10 days, 1 month, and year. Annual vignette is valid from 1.1. respective year to 31.1. in the following year. For vehicles over 3.5 tons is crossing highway sections charged with the toll system, the fee depends on the category of vehicle miles traveled. For more information, including price list, information for drivers of vehicles over 3.5 tons, disabled persons and outlets can be found below on this page. According to the new wording of the law, which is valid from January 1, 2015, is entitled to exemption from payment of toll fees every driver possessing a valid parking pass for the Slovak ZTP. However, for the application of this exemption is necessary to register and request to join a copy of the parking and vehicle papers. For more information, registration form and the address to send an application, visit ndsas.sk and upsvar.sk. Driving through toll, ie motorways and primary roads (list toll from the network for vehicles up to 3.5 tons different), is for vehicles over 3.5 tons charged with the toll system. To read the passage toll sections of the vehicle must be equipped with toll facilities OBU (onboard unit). This facility is provided under a contract for the provision of on-board units. The charges for the passage toll is derived from the distance traveled and the EURO emission class of the vehicle. Detailed information about the toll system, its use, charging zones, calculator prices and customer centers can be found on emyto.sk. i am driving a car with 30 day international registration numbers. Do i still need to buy a vignette for Slovak? yes, you need to buy Slovak vignette. More information and purchase on eznamka.sk. I need to make a single trip to Bratislava airport from Vienna. To avoid tools Google suggests to use route 61 after crossing the border and then take E58 until the turn to Ivanská cesta (after passing IKEA on the left). Does this trip require the vignette? Thanks! please use toll roads map from ndsas.sk website. Thank you. 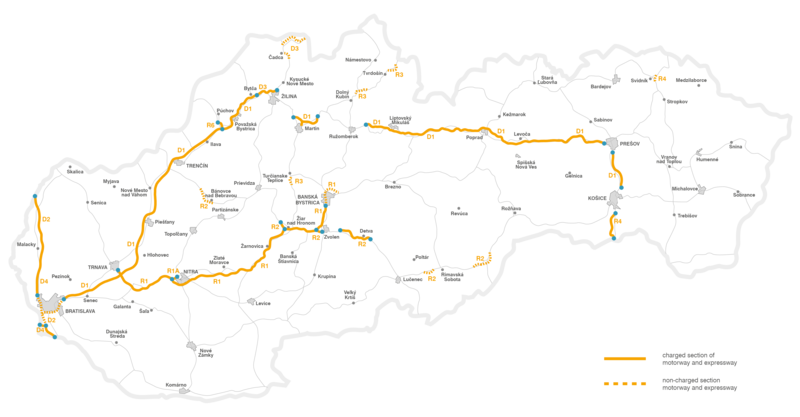 Hello we will travel in Slovakia and we will use Route 2 and Route 61. So we will NOT use a highway. I guess we don't need to pay vignette, right? you can passage this route without vignette. Near your route are toll roads D2, D4 only. A little confused. I downloaded a map from NDS and there is green motorways under preparation mentioned like D3 and motorways under construction like R7 so what about them. Do we need vignette? I recomend use map from slovak language version of ndsas.sk. can I buy the vignette so I'm covered? you can buy Slovakia e-vignette online on the eznamka.sk. I am planning to go from Hungary to Poland (Krakow) via Slovakia. My route is on European road E77. In this case, do I need to buy any type of road tax for Slovakia? for vehicles weighing up to 3,5t is E77 toll road near Zvolen and Banska Bystrica. For more information please visit links below. for information about toll unit please visit multilanguage website emyto.sk. I bought on 16th August a 10 days vignette to Slovakia from Poland and i was in Poland on 26th August at 00:30 . Can somebody please tell me if what happens in this cases? please send question to customer support on website eznamka.sk. You can switch site language to english. Planning to visit Slovakia in my motorhome which weighs 4.6 tonnes do I need to buy a vignette or a Go-Box and pay per kilometer I travel? for car weighting up to 3,5t with trailer you can buy 2 e-vignettes (one for car and one for trailer). If you have car weighting over 3,5t you'll need electronic toll unit. Slovakia motorway vignette is nessecery on highway and some speedways only. Map of Slovakia toll roads for vehicles weighting up to 3,5t you can find on the links bellow. I'm going to travel across both Czech republic and Slovenská republika. Is there any kind of universal vignette, or I don't have any choice as to buy one for Czech and one for Slovakia, separately? Czech and Slovakia vignette are selling separetly only. You can buy Slovakia vignette online, Czech vignette at border crossing or petrol station. I just purchased an electronic vignette online. Do I need to print the confirmation to keep in the vehicle? you don't need to print confirmation of purchase slovak e-vignette. More information you can find on the link under (use language switcher please). Hello, Can you please tell me if on highway D2, at the boarder of Czech and Slovakia until the first exit of the highway is needed any vignette or other tax? first exit Kúty on D2 is on toll road. D2 highway in Slovakia is toll road from border crossing Brodské (CZ/SK). Best regards, Have a nice day! heloo pliss is there anywhere where i can check locator of toll statioon (placess where i can buy vignetts)? e-vignette you can buy online or at border crossing to Slovakia. Hi, I have already toll for one year, and I will change my car. How can I replace my tool to my new car? there are e-vignettes only in Slovakia for this year. You can send request on the official website eznamka.sk. I plan to drive from Bratislava airport to Prague. Please give me information about vignette/tolls on the way. Can I buy single vignette that is valid both in Slovakia and Czechia? If yes where and how (online, cash, card...). Slovakia e-vignette you can buy online and czech vignette on petrol stations near border. Is this electronic vignette system really working? I do not have to stick it to the windshield anymore? Because last time i had a tough time finding a freaking vignette when crossing the border from Hungary on E75. (as you on purpose do not have those in order to have us pay the huge fines). After I hardly found sticker vignettes (by getting OFF the highway and losing one hour finding a post office in a small and obscure town)and stuck it to the windscreen, I had an argument with a rigid and ... slovak police officer, arguing it is not at the very top of the windscreen, where i already had another 2 vignettes placed BEFORE in countries i come from BEFORE. Can anybody tell me, what if I gave wrong registration country for my car before the payment (Thank you chrome Autofill)? I have got now a confirmation e-mail with correct plate no. but wrong registartion country. What can I do now? Is it possible to change the ordering data after payment? Or just drive and pray? please use contact form in link bellow. you can buy Slovakia electronic vignette online. can i check online locator of toll station ..?